“Even a bad high school student,” President Donald Trump told a gathering of law and order officers on 8 February, could understand the language and intent of his Executive Order 3769 that suspended entry of all refugees into the United States for 120 days, barred Syrian refugees indefinitely, and prohibited entry of citizens from seven predominantly Muslim countries into the United States for 90 days. One day later, the 9th US Circuit Court of Appeals thought otherwise and refused to reinstate the Order in a carefully reasoned opinion. While the ultimate fate of the Muslim ban remains in limbo, it seems clear the Trump presidency is unlikely to be remembered for its vigorous championing of human rights. But it has already produced powerful forms of resistance that may put human rights center stage in the United States again. Why, again? The United States has been slow to embrace international human rights treaties and norms. The place of the United States in the making of a global human rights order had in fact significantly diminished long before Donald Trump appeared on the political scene. 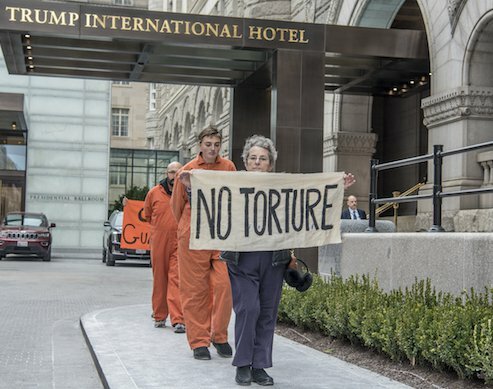 Beyond the culpability of the Bush administration in the practices of torture in the wake of 9/11, the reticence of the American state to engage in the global human rights order has a deep history. Since the 1950s, the United States has been slow to embrace international human rights treaties and norms. The US Senate ratified the Genocide Convention only in 1988, some 40 years after it was adopted by the United Nations. In 2017, the United States remains the only country in the world that has not signed the Convention on the Rights of the Child, and is among only seven countries that have failed to ratify the Convention on the Elimination of All Forms of Discrimination against Women. The United States is also not a participant in the International Criminal Court, which prosecutes individuals for crimes of genocide, war crimes, and crimes against humanity. The United States was only the 22nd country to legalize gay marriage. Perhaps even more surprisingly, the reluctance of the American state to fully embrace global human rights is mirrored in contemporary civil society. Most of the major American social movements of the last decade—among them the Occupy protests, the Fair Immigration Movement, the Fight for $15 (minimum wage), the Marriage Equality Movement, and Black Lives Matter—took primary inspiration from alternative political and moral lexicons. In challenging the mounting chasm in wealth and income between the top one percent of Americans and the rest, the mass incarceration of African Americans, escalating detentions and deportations of immigrants, and growing racial disparities in policing, education, and income, these movements could have turned to the language of the Universal Declaration of Human Rights. It promises universal guarantees to economic and social rights, to asylum, and to live without racial and gender discrimination. Yet, even though at times these movements have made rhetorical gestures to the lexicon of human rights, their energies and tactics on the ground have operated largely around a domestic space in which structural arguments about economics and race at home seem to gain better traction than oppositional political discourses that draw on global human rights norms and practices. It was not always so. In the 1940s, the United States was fully present at the creation of a global rights order and African American, Japanese American, and Native American activists embraced UN human rights norms to fight dozens of cases of domestic discrimination. For instance, in 1946, African American homeowners Orsell and Minnie McGhee turned to human rights guarantees in the United Nations Charter when a whites-only restrictive covenant threatened to remove them from their Detroit home. Three decades later, some 400 US-based human rights organizations were established as human rights became part of American professional practice. Doctors, lawyers, journalists, physicists, bankers, accountants, chemists, university and high school teachers, students, senior citizens, social workers, ministers, librarians, grants officers at the nation’s leading foundations, psychologists and psychiatrists, dentists, and even statisticians—all found human rights in the 1970s. To some extent they never let go. If the 1970s marked the beginning of human rights as vocation, the professional turn has only intensified in the 21st century. Human rights are now deeply embedded in the curriculums of most professional schools, from schools of medicine and law to business. There is a proliferation of undergraduate and graduate programs in human rights at US colleges and universities, with many of their graduates going to work in what is now considered “the human rights field” at nonprofits or in business. Indeed the quotidian spread of human rights into the fabric of contemporary American society has been quite remarkable. What changed between the 1940s and 1970s, however, was the location of American human rights concerns. In the 1940s, human rights were seen by many as doing political work both inside and outside of the United States. Campaigns against domestic and international rights abuses were deeply entangled. But when human rights were recovered and remade by a variety of Americans after 1970, the focus narrowed. Human rights offered a lens to understand problems far from American shores—in Brazil, Chile, the Soviet Union, Poland or China. Only rarely did global rights norms play a role within social movements in the United States itself. A month into the Trump presidency, the lines between violations of rights at home and abroad are already increasingly blurred. The nation’s airports became sites of detention. Guantanamo might again be open for business, perhaps to put into practice candidate Trump’s belief that “torture works.” As the necessary resistance begins to an administration’s policies that gravely threaten the physical and mental well-being of the most vulnerable peoples among us, global rights norms potentially offer a set of vocabularies and practices that could mobilize Americans to once again make human rights a central tool for political action—just as they did for Orsell and Minnie McGhee in Detroit more than 70 years ago. The language of human rights remains there for the taking today. Indeed the era of Trump could ultimately be remembered not just for the president’s own disregard for human rights but as the moment that marked the recovery in American civil society of the moral and political power of global human rights for our lives at home and in the world.